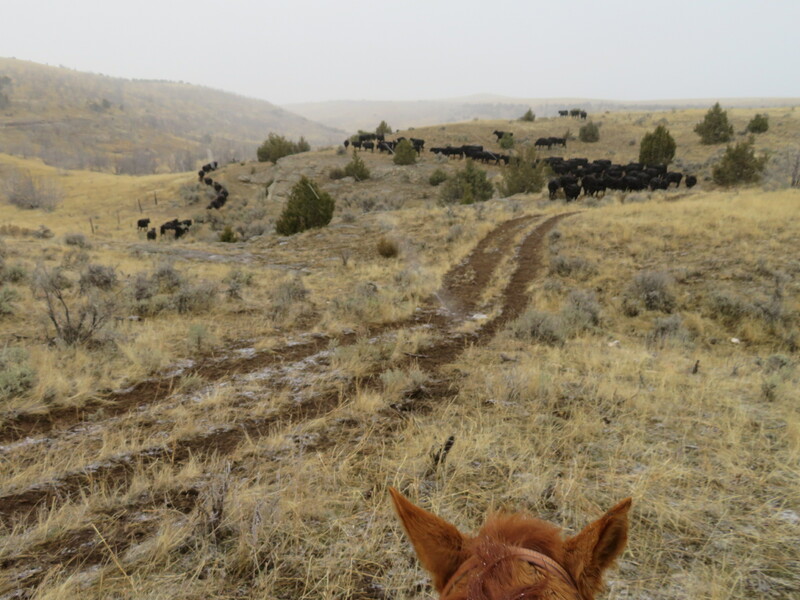 After delaying our gather on our Mesa Pasture for two days, we had to do it today, come rain or shine… or snow. Yesterday, Daniel had pulled the pump from the creek, and the cows would have no water to drink. That left us no choice. We were bundled up… good thing, too. The day alternated from cloudy to snow to cloudy to windy… and just plain cold. 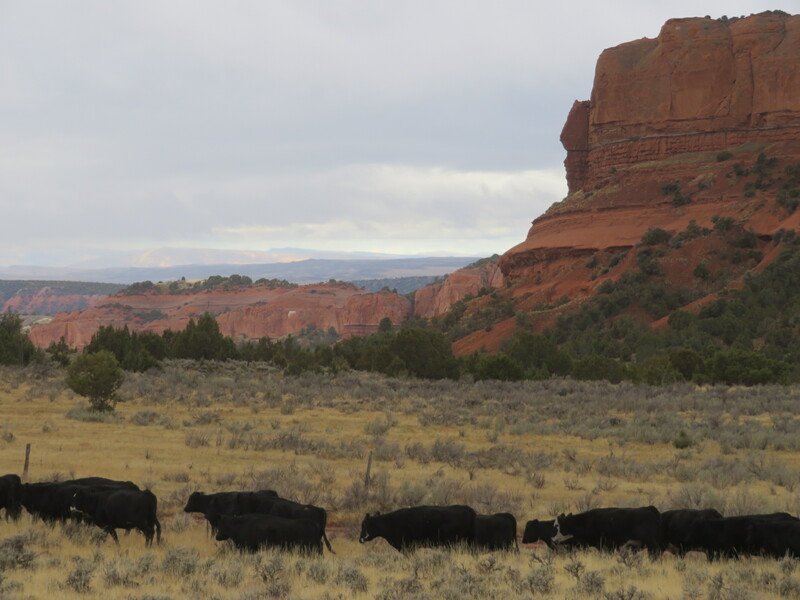 The cows were anxious to go SOMEWHERE, and they missed a turn or two along the way, the storm revving their energy level! We were lucky. 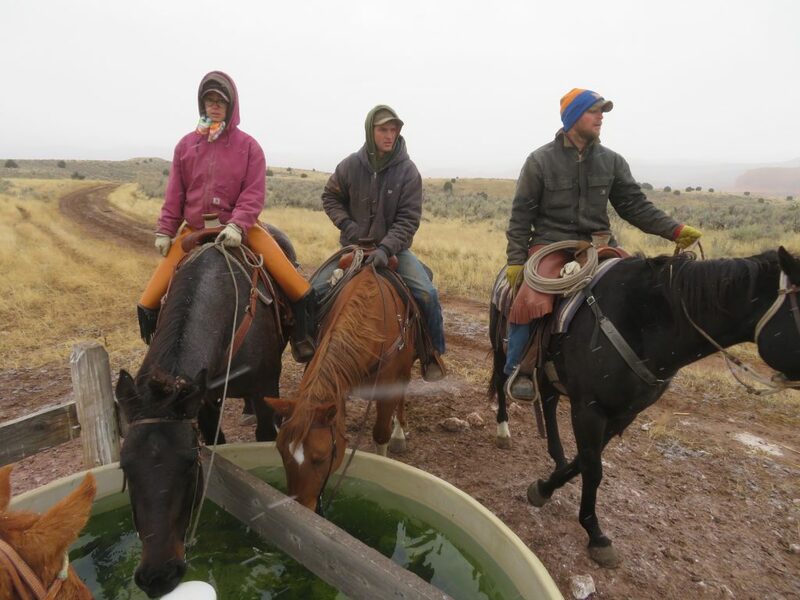 No big storm hit us until we were just finishing up… we hope that luck holds, as we will be doing cow work all week! I love the photos that also include your horse, even if just the ears. Oh damp and cold are a challenge. Wrap up warm. Hot drinks to look forward to when you get home. Thank goodness for Carharts, thinsulate, etc. Hope you get some better days, sure you’ll have worse ones when you have to be out. The fun is just beginning. Oh my, that looks like a chilly-wet day. My feet feel cold just by my (me? )looking at the photos! Fingers & toes crossed for much nicer weather for the “fair weather cowboys”. Chugwater formation in the last picture, yes? no?